Read-a-Card is a software utility that runs on a Windows PC and reads information from many types of contactless cards and tags. For instance, unique chip IDs and securely encoded card numbers can be read and logged to file, and automatically sent to other software or web applications using many different methods, including simply 'typing' the card ID (sometimes known as a 'keyboard wedge'). This complete hardware and software package comes with a pre-licensed Omnikey 5325 CL USB 125KHz Prox reader. The software can be installed and run on any Windows PC, as long as the reader is present. The Omnikey 5325 CL supports HID Prox only (including Corporate 1000). 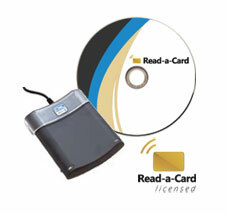 Read-a-Card is compatible with a wide range of contactless readers from different manufacturers, and can be used to identify different RFID cards and tags, test reader functionality and to enable the use of multiple readers on a single PC. It can integrate with other software and systems using a variety of methods and techniques. Read-a-Card also provides the ability to decode customer-specific card numbering formats stored on either MIFARE, DESFire or iClass cards, through the use of software plug-ins and hardware security modules (SAMs) for holding keys and other sensitive data. Using this mechanism, Read-a-Card can be enhanced to be able to read a site-specific format and return the relevant card ID data to other applications using its built-in keyboard wedge, file logging or direct integration APIs, without exposing the encoding scheme security data. Notes: Up to 10 ACR1255U readers can be connected simultaneously via Bluetooth, using the ACS driver/tools. The ACR1252U SAM supports SAM licensing. Notes: All Omnikey readers support e-licensing apart from 5025 CL. Legacy iClass reading is supported on the 5021 CL only (plus previous 5321 models). Non-legacy iClass SE and Seos card reading is not currently supported, and will require an Omnikey 5023 when released. This package enables the reading of the unique card IDs from various types of contactless cards and tags. Includes an Omnikey 5021 CL contactless smartcard reader and a matching software e-license.